Brandon Ngai-Illinois (Left), Sean Melton-Ohio State (Middle), Hunter Justus- Oklahoma (Right). The Nissen-Emery Award is college gymnastics most prestigious award for senior gymnasts. This year the seven finalists are Joel Gagnon (Minnesota), Austin Hodges (Iowa), Hunter Justus (Oklahoma), Kyle King (Nebraska), Sean Melton (Ohio), Robert Neff (Stanford), and Brandon Ngai (Illinois). Previous articleIs the Big Ten the most competitive NCAA conference? 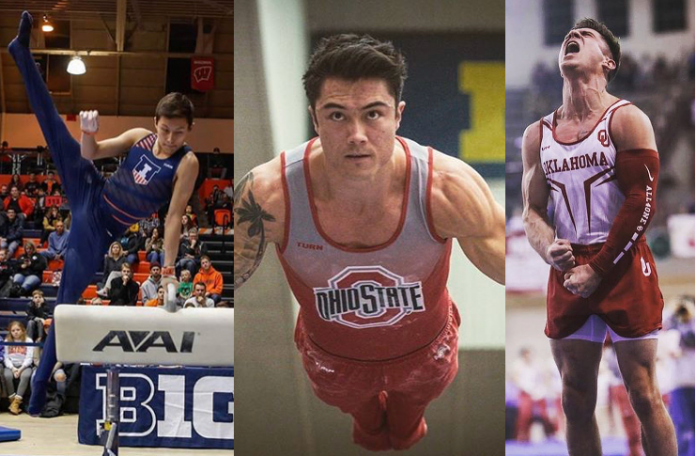 Next articleWho’s the NCAA Men’s Gymnastics Championships team Favorite? UCLA Gymnastics, Who will be the next head coach? Ms Fit N Grind | Speed Walk Tag! Midknight Robin, Remi Marvin, Taqiy Abdullah-Simmons, and Kerry Adderly co-host this weekday gymnastics talk show, joined by regular contributors, analysts, and guests. The show includes weekly news, interviews with sports athletes, coaches, entertainers, and personalities, spirited debates, and an assortment of other topics. NCAA Gymnastics season is back!